After the Meridian, I ordered the battery case widely regarded as the leader of the pack, the Mophie Juicepack Plus, $119.95 at press time. Mophie, which like Lenmar makes cases for the iPhone and other smartphones, appears to have “heard the market”: Mophie originally offered only its Juicepack Helium case, which compared to the Meridian offers a lackluster 1,500 mAh of added battery life, but Mophie has added the Juicepack Air (1,700 mAh), and just came out with the Plus, still short of the Meridian but offering a respectable 2,100 mAh of juice. Mophie Juicepack cases are sturdy, and so well-regarded (or well-connected) that both Apple and Verizon resell them. *** The Juicepack has high-quality buttons built into the case for power, sound on/off, and volume. When the iPhone’s battery runs low, you flick a switch on the back of the case and the Juicepack in effect “reloads” the phone’s charge. To see how much juice the case has left, you press a flush-mounted button that flashes from one to four lights: four means the case is fully charged, three means it is 75 percent charged, and so on. One thing I did not know about the Mophie case for the iPhone 5 is that it does not support syncing with iTunes when you connect it to a USB port on your computer. Lenmar’s Meridian does, and the Juicepack is such a sleek, slickly-produced case that I expected nothing less from it. With all of these cases, you must use their supplied USB connector cords to charge them, not the cord that came with the iPhone 5 itself. A ‘male’ connector inside the case plugs into the iPhone 5’s ‘female’ Lightning connector slot, but the power slot on the case is different from the one on the phone. You connect the other end of the cord into a USB slot on your computer to sync or charge it, or connect the cord to the original iPhone power plug (“iPhone square”) to charge it through a wall outlet. WiFi sync – when iPhone and computer are connected to the same WiFi network, you theoretically can sync iPhone with iTunes via WiFi. To set this up the first time, you connect the iPhone to the computer via the Lightning cable and choose Sync via WiFi. Lightning sync – the Juicepack is a two-piece design, so you pull off the bottom (smaller) piece of the case to access the phone’s Lightning port, and connect using the Lightning cable. Somewhere in Mophie’s marketing materials it says you may never need to remove your iPhone from the case, and that is good, because the Juicepack fits the iPhone like a high-tech, high-quality glove, and it can be a bit testy removing phone from case. That “like a glove” factor, or more to the point, the lack thereof, can be important. More on that in a moment. 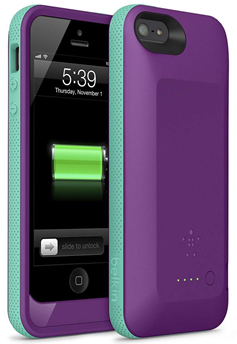 Belkin’s case is also MFI-certified. In order to obtain MFI certification, Apple mandated that Belkin’s case must not allow pass-through syncing with iTunes. The nice people I spoke with at Belkin were more than a little intrigued to learn that there was an MFI-certified case out there, the Lenmar Meridian, that does USB-sync. My research of the market led to one last case I would consider: the PowerPack Slim Fit from i-Blason, a 2,200-mAh case listed for $59.95 on the company’s own site at press time, but which I bought for $49.95 on Amazon.com (seller: Amazon). The Slim Fit’s form factor is a lot like the Juicepack, and like the Grip, it comes in a rainbow of colors. I chose basic black, which lends a soft, rubberized counterpoint to the high-gloss white iPhone. The Slim Fit started coming apart in my pocket. As opposed to the Mophie Juicepack, which fits the iPhone 5 like a glove, or maybe more accurately, like high-tech armor, I found that the Slim Fit fits the iPhone like…well, like a cheap suit. Removing phone from case was a breeze, which was cool for “going commando” on my daily 6-to-9-mile powerwalks. No, not that kind of commando; I mean popping iPhone only, sans battery case, in the weatherproof armband I like to wear out there. Yet the dark side of that convenience was that, in certain pants and under certain conditions, when it was a bit tougher getting the phone “out of pocket,” the top section of the Slim Fit case started popping off. If anyone’s going to pop off, it’s me, not my battery case. One day the Slim Fit seemed ready to literally set the world on fire, starting with me. The case got so hot that the first thing that came to mind was how the time-worn phrase “liar liar” may be in need of an update to “Slim Fit user, Slim Fit user, pants on fire.” A few hours later, the case stopped working altogether. First are companies who take what I’m guessing is the cheaper “cutouts” approach: you have a battery case, but must reach through it to use the iPhone’s own power and volume controls. Examples include Lenmar, PhoneSuit, Maxboost, iBattz, and iKit. Then come those who take what I’m guessing is the more expensive approach: adding a rubber or plastic ring around the case and building buttons for power and all sound controls into the case; the buttons themselves are either rubberized or metal. 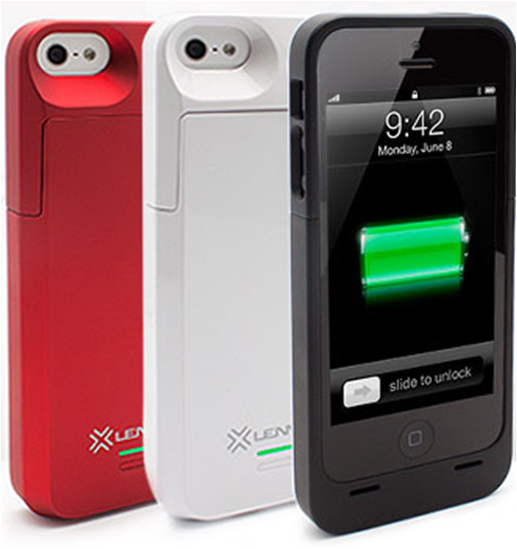 Examples include Mophie, Belkin, and i-Blason. Some companies add the ring and build in a power button, but do a cutout for either sound on/off, or volume, or both. Examples include MyCharge and iContact. Others such as Incipio and Naztech used to offer battery cases but no longer do, possibly due to manufacturing or cost factors. Then there is OtterBox, whose users border on true-believer fanaticism over its ruggedly weather- and damage-resistant cases, but which at press time still does not offer an iPhone 5 battery case. If Lenmar offered built-in power and volume buttons on the Meridian, it could be the best case on the market because it offers the most juice (2,300 mAh) of any of these. Plus several competitors could take a lesson in customer service from Lenmar, whose people are extremely nice and helpful. That said, if OtterBox came out with a battery case that offered numbers in the 2,000 mAh range, I believe that would mount the strongest challenge to Mophie’s supremacy. I’ve never met an OtterBox user who did not rave over his or her (non-battery) smartphone case, and that would translate into instant revenue if the company were to amp up its market presence with a battery case. Of course, the next question would be whether OtterBox could manufacture a battery case that would embody the seemingly-miraculous moisture and ‘hard knocks’ protective qualities of its existing line of non-battery-equipped cases. While I appreciate the opportunity to obtain answers from the manufacturers of iPhone 5 battery cases, the larger questions fall to Apple itself. So I asked Apple why it forbids makers of iPhone 5 battery cases from offering USB pass-through sync with iTunes. Apple said it does not allow it because they are third-party devices, but the company had no answer as to why one of the MFI-certified cases on the market does USB-sync. Why doesn’t, or can’t, Apple make an iPhone 5 battery that lasts long enough for even heavier users to make it through the day without scrambling for an electrical outlet? 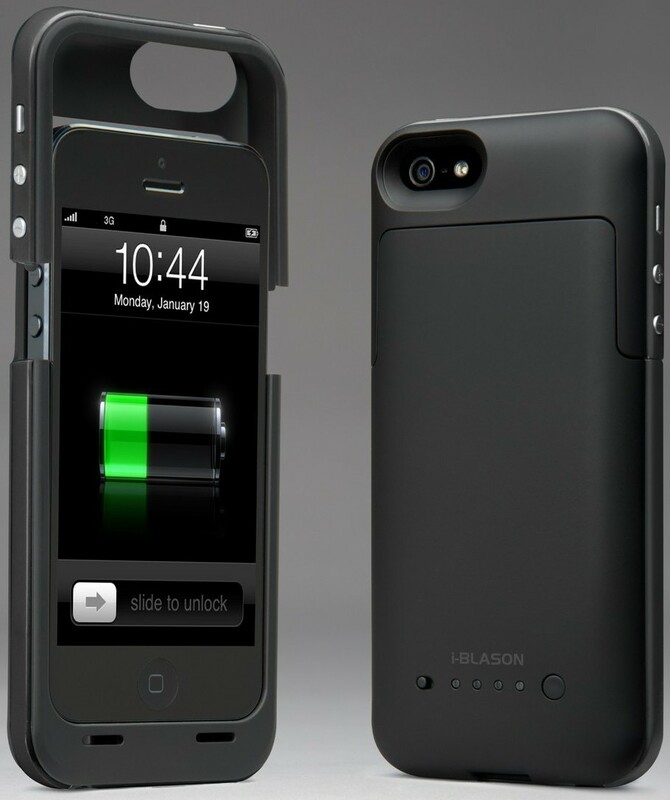 If it did, iPhone 5 battery cases would be a non-issue (and a non-market). Why should syncing your iPhone with your computer depend on WiFi? WiFi sync is notoriously unreliable, and if you’re in a spot with no WiFi, to sync you have to pull the phone out of the case. Apple has built its phenomenal business largely on the basis of making technology work, and making it work more easily. Why would Apple make things less convenient for customers and more arduous for its suppliers/business partners? If better iPhone 5 battery life is not in the cards, why doesn’t Apple make its own battery case? That would obviate the issue of “third-party devices,” and Apple could give its own battery case the USB Pass-Through Sync With iTunes superpower. I posed these Qs to Apple today, and when I get answers I will update this piece. **A 2,300 mAh battery means the battery will release 2,300 milliamps of current at a specific voltage for one hour before it is discharged. The higher the mAh, the longer the battery life, so the bigger the number, the better. *** Currently the Juicepack Plus for the iPhone 5 is not available through Apple, but it almost certainly will be someday, because the Helium and Air already are. My guess is that Mophie is, and if so, deservedly so, reserving all of the i5 JP+ initial release revenue for itself rather than sharing the wealth with Apple or Verizon just yet.